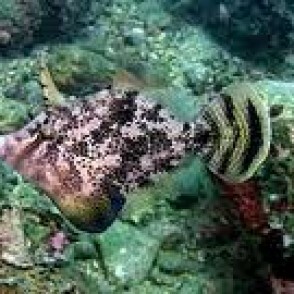 The Fan-bellied Leatherjacket or Fan-bellied Filefish (Monacanthus chinensis) has a flattened body and trigger-like dorsal spine common with all filefish. This filefish also has a large, flat fan-like fin on its underside. Its body is a variable greenish-brown and may have darker spots or wide, diagonal bands. Filefish are related to the “Triggerfish” common to the aquarium trade but are generally much more docile and peaceful in nature. 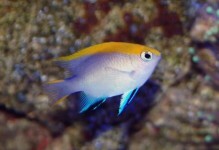 Although they are compatible with most fish of a similar temperament, they are generally not Reef Safe and will pick at corals, polyps, crabs and other invertebrates. 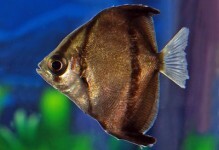 They are best kept in a peaceful, fish-only community aquarium. 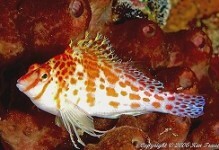 Some filefish may be tricky to acclimate to an aquarium diet. Most will accept meaty foods like plankton, clams, brine shrimp, mysis shrimp and similar items. Filefish have small mouths designed for picking food items from small crevices and they cannot eat large items. 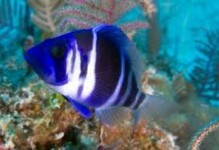 They may still pick at or attempt to eat crustaceans like shrimp however and may pick at or eat some corals and polyps.